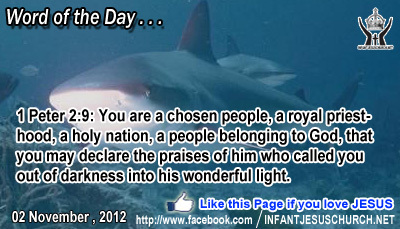 1 Peter 2:9: You are a chosen people, a royal priesthood, a holy nation, a people belonging to God, that you may declare the praises of him who called you out of darkness into his wonderful light. Heavenly Father, we praise you and thank you for including us in your people. Now please move us and make powerful us to share your Gospel with others so that the world might truly know that Jesus is Lord. In the name Infant Jesus, we pray. Amen. What is faith and how do we gro0w in it? Faith is an entirely free gift which God makes to us. It is the Holy Spirit who exposes who Jesus is. We can believe in Jesus Christ because he is himself God, the Word made f1esh. Faith is a personal adherence to God and the free agree to the whole truth which God has revealed. Faith is active obedience to the One who created us in love and who sustains us by his grace and power. To follow in faith is to submit freely to the word that has been hear9d, because its truth has been certain by God, who is Truth itself. We can trust ourselves wholly to God and believe totally what he says. To live, grow, and persist in faith to the end we must nurture it with the word of God. Loving Infant Jesus, your death brought us life and hope where there was once only misery and defeat. Give us the unshakeable hope of eternal life, the inexpressible joy of knowing your abiding love, and the unquestioning faith and zeal in doing the will of the Heavenly Father.